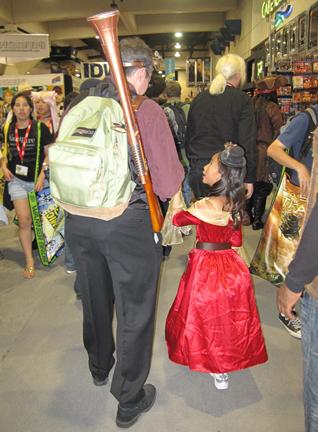 In a couple of days, my daughters and I will be making our way to San Diego for Comic-Con International. Not Karen--she's been to a few Comic-Cons and that was plenty. Although I'm not up for any awards this year, I have been asked to be a Special Guest, which is a big sweet deal. This is my second time Special Guesting; the first was after Mom's Cancer came out in 2006. They take very good care of their Special Guests, only asking in return that I do a Spotlight Panel in which I talk about myself for 45 minutes, and in general be a good, cooperative ambassador for comics. Comic-Con offered me a table in Artists' Alley but I declined, having nothing left to show or sell. I'd much rather wander than sit anyway. My home away from home will be the Abrams booth (#1216). If you really want to reach me you could try leaving a note there, but no promises. When you drop by, be sure to look over all the amazing Abrams books. Thursday, July 19, 4:00-5:00: I'll be drawing to help raise money for the Cartoon Art Museum (#1930). The idea is that people can drop by and, for a $10 donation, cartoonists will draw anything they want. I did it once before and discovered I'm terrible at it. Somewhere out there is a father and son to whom I owe $10 for a regrettable "Chewbacca playing basketball" I drew for them. In fact, I told CAM curator Andrew Farago I never wanted to do it again, but he put me on the schedule anyway. So I guess I'm doing it again. I promise to try my best. Friday, July 20, Noon-1:00: I'll be part of a panel called "Peanuts Family Album," based on a book of the same name by moderator Andrew Farago (him again). The other panelists are my pal Lex Fajardo (Kid Beowulf and the Schulz Studio), Rachel Fellman (Schulz Museum), Nat Gertler (lots of stuff including About Comics), Lonnie Millsap (Bacön), and Jeff Pidgeon (Toy Story). It'll be a fun excursion into the more obscure characters in the "Peanuts" pantheon. I plan to have some very interesting insights into Molly Volley. It's happening outside the Convention Center, in the Grand 9 room at the nearby Marriott. Friday, July 20, 2:00-3:00: Spotlight on Brian Fies. My Main Event! I genuinely think this will be neat. I asked my friend and editor Charlie Kochman to sit and talk with me, which is a good format that avoids the awkwardness of me droning about myself. Astonishingly, he agreed. We'll take a look back at what I've done but mostly focus ahead on what I'm doing. We might even have some sort of cool collectible giveaway, although I've already said too much. It's in Room 4, which is one of the smaller rooms upstairs. It would be great to see you! Those are my commitments. I've also been invited to a couple of professional parties, which is a first for me. You'll find me standing alone in the corner with a beer pretending to look at my phone. Otherwise, I'll likely be wandering the aisles, looking at old comics and art, buying books, and hunting down friends. If you're one of those friends and I don't find you, I apologize in advance but you know how it is: a hundred thousand people crammed into in a square mile with never enough time to do it all. Comic-Con is a strange beast. It's been very good to me. It's also loud, crowded, and every year consumes more and more of its beautiful host city. Many of my cartoonist friends can't afford to go anymore. Just a few years ago, I could drop by a vendor's booth to pick up a convention exclusive (e.g., a special Hallmark ornament) for a friend; now the line forms at 5 a.m. and takes all day. 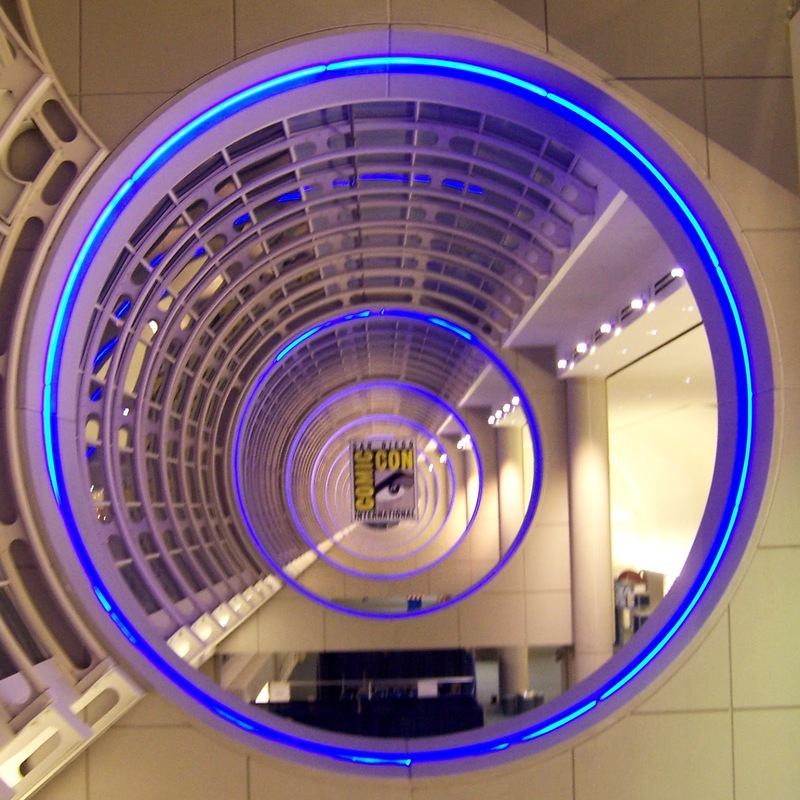 The most common complaint is that Comic-Con doesn't really have much to do with comics anymore. I sympathize but disagree. I like writer Mark Evanier's take: Comic-Com is really five or six big conventions rolled into one, and it's up to you to find your convention within it. I don't care about video games or board games, so I don't go there. I've never been in Hall H, where the big movie stars reveal sneak peeks (and the line to get in begins forming the night before). However, I just went through the program and made a list of 32 panels or events I'd like to see, almost all related to graphic novels, comic books or comic strips. I know there'll be kids selling homemade zines and vendors selling original comic art. There'll be friends I never get to see anywhere else. There'll be Klingons. Everything's better with Klingons. Comic-Con isn't what it used to be, and it isn't for everyone. But we're gonna have a good time. One of my favorite photos I've taken at a San Diego Comic-Con. It reminds me what it's all about. Is your Gorn costume pressed and ready? San Diego's too hot to cosplay as a Gorn. Now a green Orion slave girl, that I could try . . .